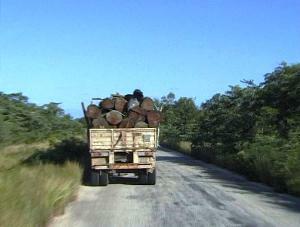 Espungabera to Inhassoro Mozambique - Road conditions. 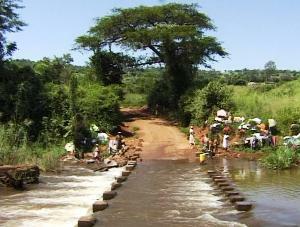 The town of Espungabera lies in the Manica Province close to the border with Zimbabwe. The architecture of the now worn-down buildings in town is a grim reminder of the once prosperous colonial influence. Espungabera once was the gateway to countless of tourists from the then Rhodesia as they embarked on the tropical beaches of Mozambique. Today the town is the gathering place for local traders where, at the markets, as in the rest of Mozambique, basically everything is on offer from Scotch whiskey to the live chicken. Mozambique has a population of about 16 million people. The official language is Portuguese. There are 13 main national languages. Religion varies from traditional African, Christian to Moslem and Hindu. The Mozambican currency is the Metical. The climate varies from sub-tropical in the south to tropical in the north. The excellent gravel road from Espungabera to the main tar road the EN1 via Hacufera and Chibavava continues for 220 km through scenic countryside. It offers you the chance to experience the other side of Mozambique different to the hustle and bustle found at the coast where the highest concentration of people occur due to the rich food source offered by the ocean. Carry enough water for drinking purposes on your trip, as we recommend not drinking tap water. It could be contaminated even in the towns and resorts. When reaching the tar you might felt tempted to speed up a bit. Don’t. This section of road up to the Save River is badly pot-holed and could bring a sudden end to your adventure. 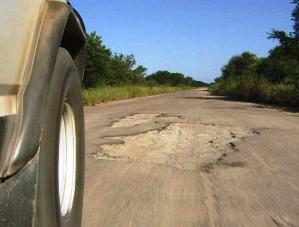 Be careful, as it is difficult to observe these holes on this 150-km stretch. You could end up in one of them. We recommend that you do not drive at night. Don’t speed and always wear your safety belts as you might be stopped by police. When stopped, you will be required to produce your documents, which is your passport, driver’s license, registration papers, temporary vehicle import permit and insurance papers. Your vehicle must always carry two emergency triangles. When towing, one must be fitted on the front of your vehicle. Be polite with the police; never pay bribes and if you are fined for some reason demand a receipt. Never part of your passport! Medical facilities in Mozambique are very basic and we recommend that you acquire emergency evacuation insurance like MRI prior to your visit. This will ensure some peace of mind. Note that malaria is rife in Mozambique and the necessary precaution should be taken. Although the main roads and coastal areas have been cleared, land mines remain a slim but very real danger to those who are tempted to leave the beaten track. Normally mined areas are marked by a special sign and cordoned off with tape. Road conditions from the Save where the magnificent bridge span the river improve drastically. From here all the way down to Maputo the road is in fair condition and is regularly maintained. Only the odd pothole is found. On this stretch of road petrol and diesel are available at regular intervals. Inhassoro is a small fishing village, which boast a filling station, traditional market, general store, some restaurants and a bakery.